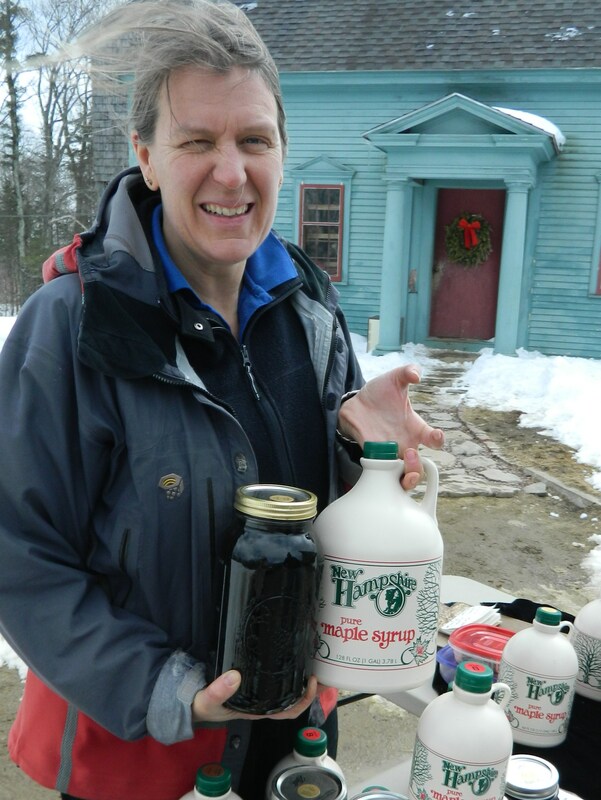 Susan Comte displays maple syrup produced at the Comte Family Farm sugarhouse on Neilson Road in Nottingham, New Hampshire. Life is sweet at the Comte Family Farm/Root Seller in Nottingham, New Hamphire. 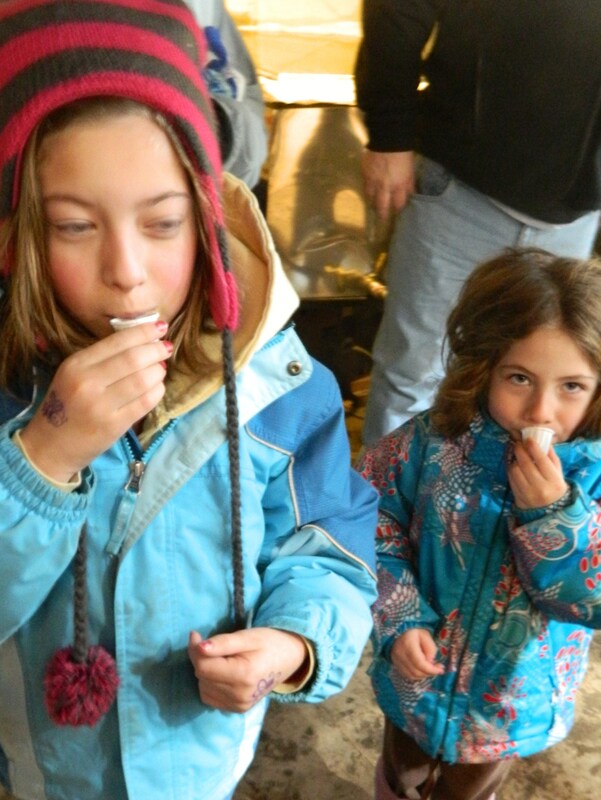 As part of the 18th annual New Hampshire Maple Weekend, visitors to the farm’s sugarhouse had a chance to sample just how sweet it is – literally. 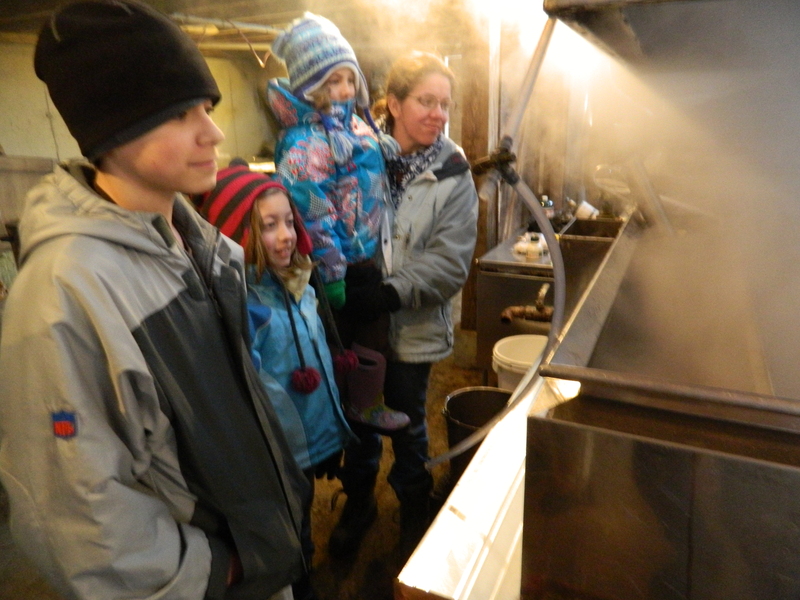 Among the 110 sugarhouses throughout the Granite State participating in the maple weekend held March 23 and 24, the Comte family – Dan, Susan and their three sons, Tyler, Andrew and Anthony – hospitably greeted those who stopped by for a firsthand look at how maple sap becomes syrup. Maple sugaring is a growing part of the family-owned and operated farm business and a learning experience for the three boys who help with all aspects of it – from helping their father stack the wood chopped right on the farm’s 136 acres, to hosting sugarhouse tours, to assisting with the sap boiling off process. 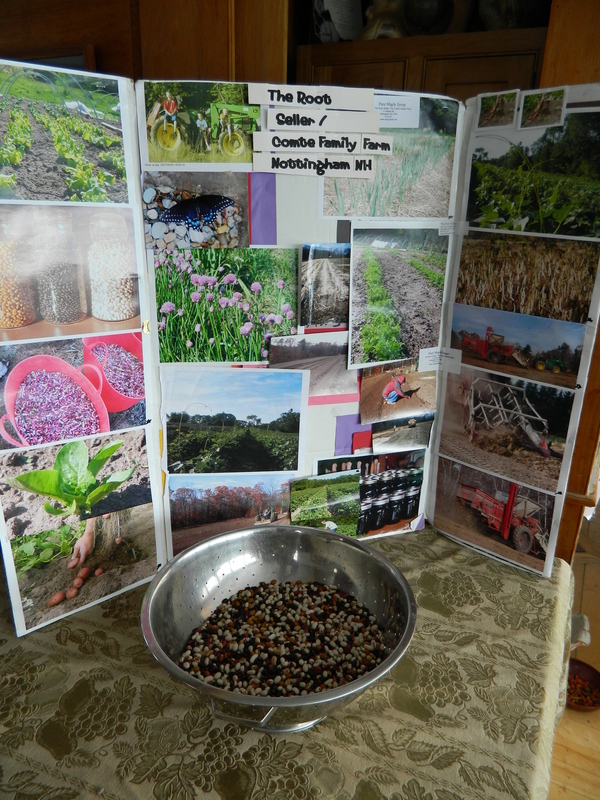 As well, often the family travels to bring their wares to winter and summer farmer’s markets across the region. 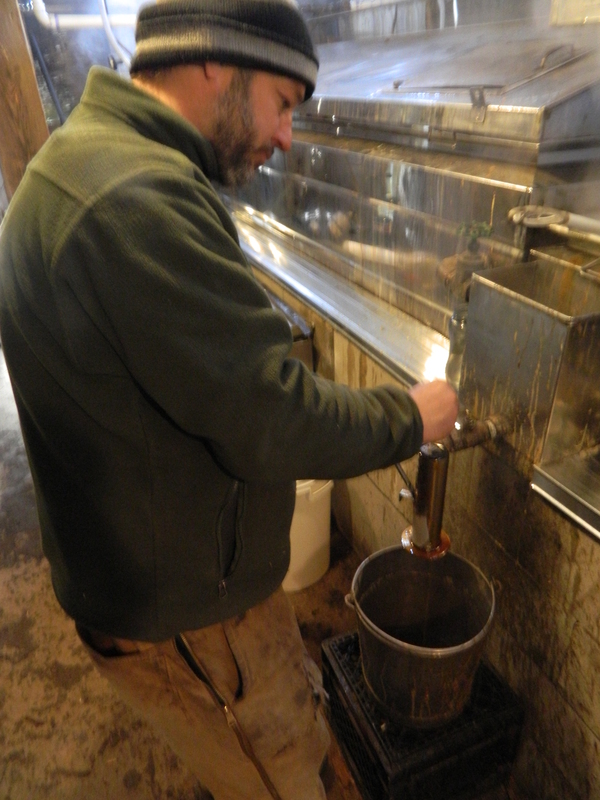 Dan Comte checks the readiness of the syrup. Anthony Comte shows piping from a tank of sap outside the sugarhouse. “But there is school and sports, ” said Susan, noting that comes first for the boys. Dan Comte inside the sugarhouse on March 23, 2013 with his three sons, Tyler, Anthony and Andrew. 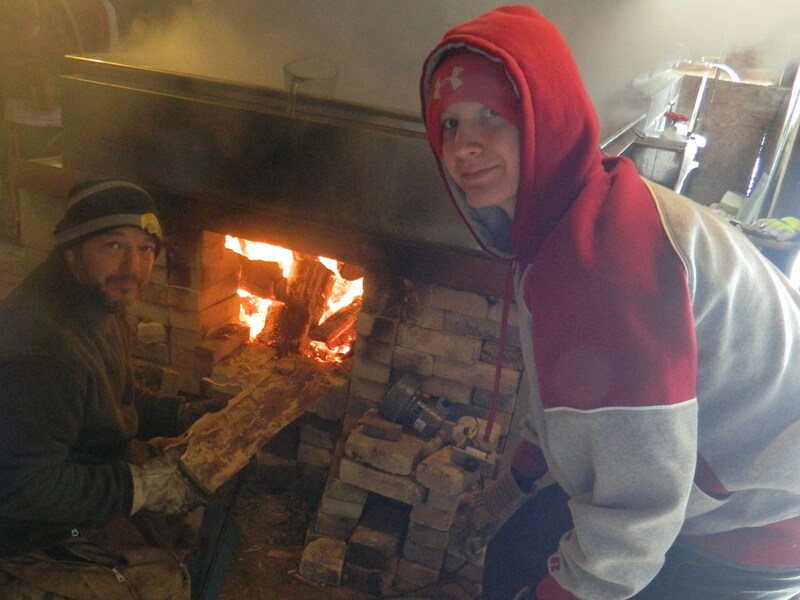 Dan and his son Tyler load seasoned wood from their property into the evaporator’s burner. 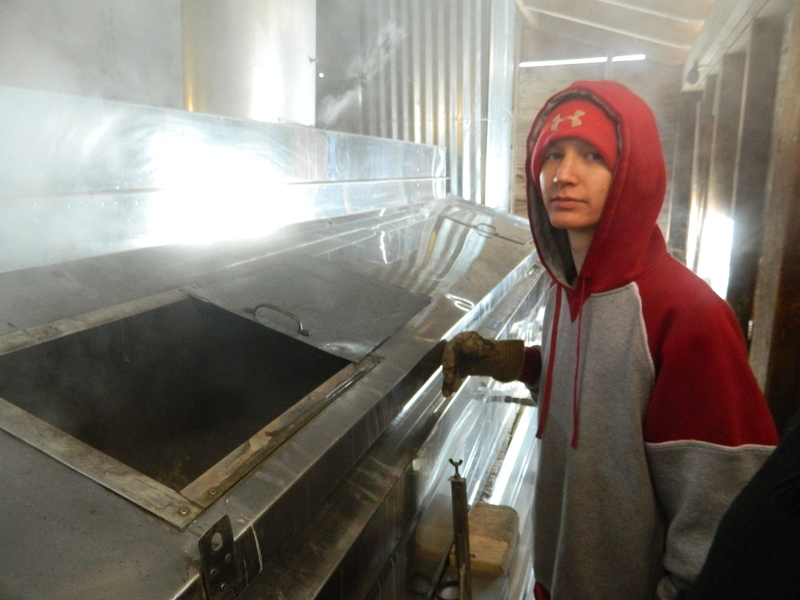 Tyler Comte shows the hundreds of gallons of sap the evaporator can hold. Because the Comtes were busy with maple weekend, Susan’s sister Mary pitched in on Saturday, manning their table at a winter farmer’s market in Tilton, N.H.
For Abby and Charlotte, a taste of maple syrup produced at Comte Family Farm. “There aren’t many winter farmer’s markets,” explained Susan. Visitors Andrew, Abby, Charlotte and their mother Heather watch the boiling off process. Throughout the afternoon on Saturday, there was a steady flow of visitors. Steam from the evaporator, in which raw sap is boiled off into syrup, periodically drifted up from the sugarhouse, filling the air with the rich aroma of sweet maple. 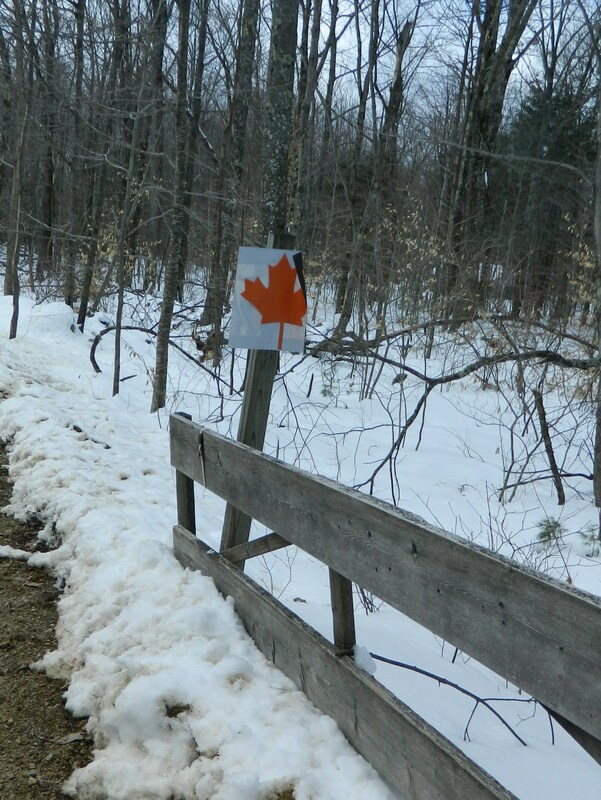 Last year, which was the first time the Comte Family Farm took part in maple weekend, they had a good turnout of about 50-75 people each day. Even more visitors were expected to come by this year. “People stop by and meet you – they develop a loyalty,” said Susan. Comte Family Farm strives to build positive relationships with their customers and to be sensitive to their concerns, added Susan. 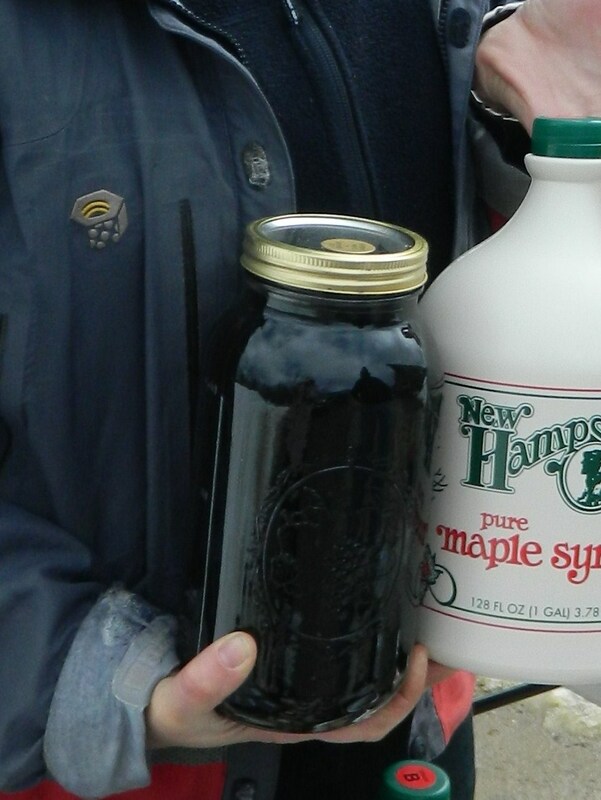 Therefore, in addition to selling their maple syrup in the familiar looking plastic jugs that read “New Hampshire pure maple syrup” and are popular for transport purposes, the syrup is also available in beautiful glass jars. 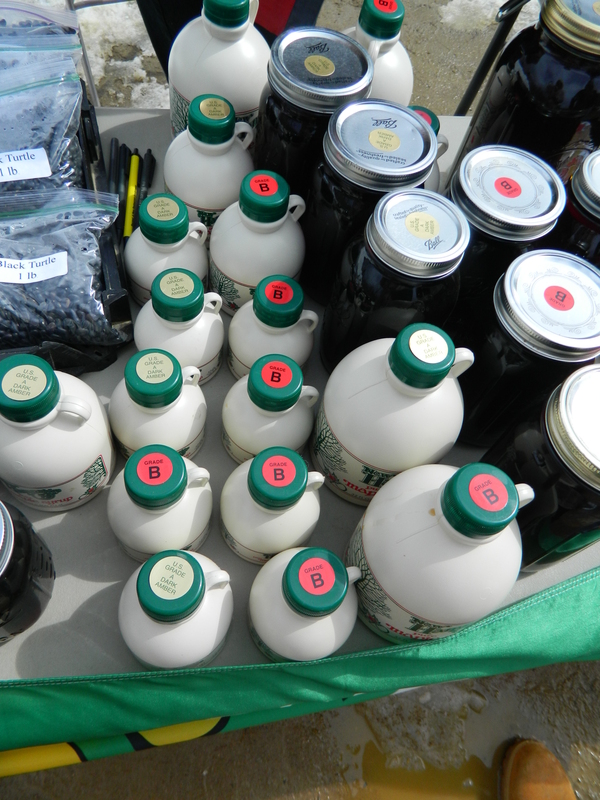 Besides maple sugaring, as part of the family livelihood, they grow twelve acres of vegetables on the farm. 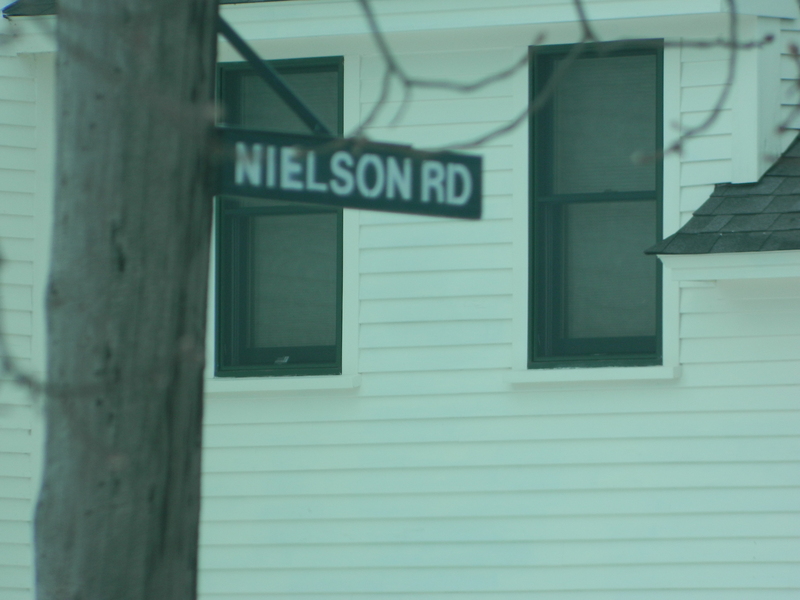 According to Dan, participation in maple weekend increases exposure for the farm which is especially beneficial due to its location at the very end of Neilson Road. In fact, the Comtes marked the long road with pictures of amber colored maple leaves to let folks know they were headed along the correct path. On the road to Comte Farm. Susan earned her degree in art from the Boston College of Fine Arts. Dan holds a degree in business from Keene State College. After graduation, they met, fell in love, got married, initially bought a different home in Nottingham not far from where they live now and made pottery goods. However, when the farm became available they decided to move. Keeping the old beams in place, Dan converted the existing barn into the sugarhouse. Two years ago, he invested in a 5 foot by 14 foot evaporator that is located downstairs. He then modified the design of the evaporator, adding thicker insulation for the burner to maximize fuel efficiency by minimizing the amount of wood needed for the boiling off process. Generally, he burns some 25 cords of wood each season. Dan installed extensive piping on the farm to carry the sap from the maple trees to a tank outside the sugarhouse; the sap is then piped inside. Facilitated by warm days and cold nights typical of mid-February and March in New England, this season’s yield has been flowing abundantly from the small taps. 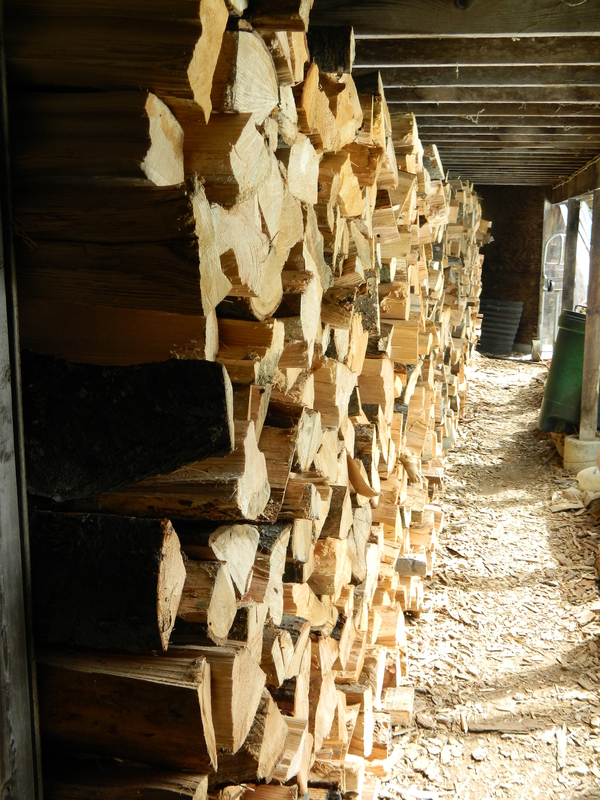 The result – six intensive weeks of tending to the maple sugaring including long days that morph into long evenings, usually punctuated by a few marathon nights. “In 1997 we tapped our first tree. We went from as little as 25 taps to the 1,300 we have now. My goal is 2,000,” said Dan. “I’m up around 5 a.m. and work until 9:30 or ten o’clock at night. But there are some nights when the temperatures do not go down to freezing and the sap keeps coming,” Dan said. Despite the long hours, he said he is exactly where he wants to be. “I wanted to be self-employed. I saw the potential of the farm. By buying the farm, I knew I was buying myself a job,” said Dan. 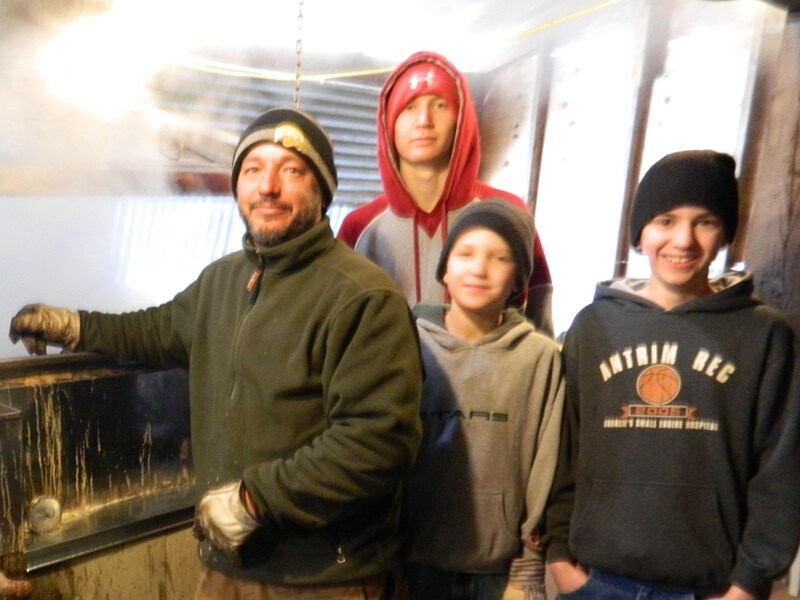 Each of the boys has something about maple sugaring that most appeals to him, from the intricacies of the sap collection system to being able to help with the family business in a hands-on way. “What I like the most about doing this is being down here, spending the time with my dad,” said Tyler. YES … life is sweet at the Comte Family Farm.